What should I do after a storm has passed? Although the storm has passed, there are many dangers that still exist. Take the proper precautions to prevent further crisis. Play it safe and focus on yourself, family, neighbors and emergency workers during cleanup and repair. If you have any doubts about safety, err on the side of caution. Help keep utility telephone lines clear for emergency calls by only calling to report downed power lines. However, if your neighbor’s power has been restored and yours is still out, please call your utility company. How can I keep my family safe after a hurricane or major storm? Often the most devastating time during a disaster occurs during recovery. Having to return to your home or business, assess damage and perform clean up can be a very difficult task. Make that time safe and productive. If your electrical equipment has gotten wet or is near water, turn off the power at the main breaker. If you must enter water to access the main switch, call an electrician to turn it off. Do not turn electrical equipment back on until it has been inspected by a qualified electrician. 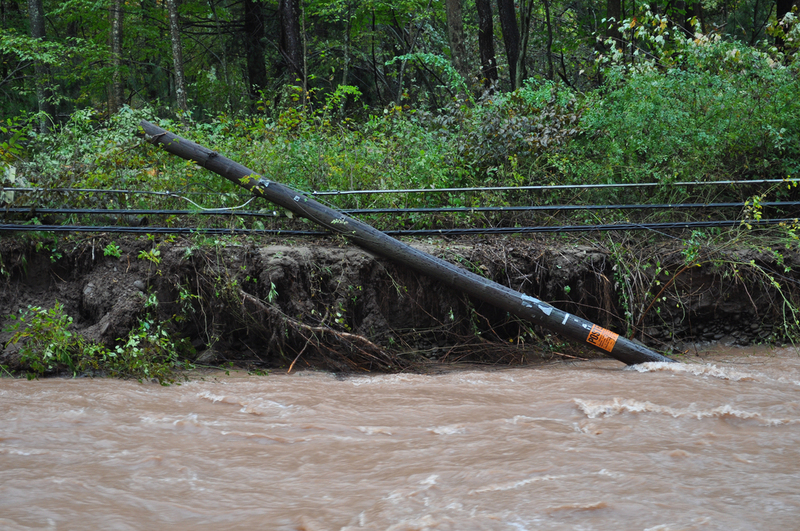 Stay clear of downed power lines, as they may still be energized and dangerous. Puddles of water contacting downed lines are just as dangerous. Do not trim trees or remove debris located near downed power lines. If you must remove debris from in or around your home, do not pile it under or near electrical lines or equipment. If appliances were on when the power was lost, make sure all appliances are turned off. If left on, they could pose fire hazards when the power is restored. Refrain from using candles. Use a battery-operated flashlight as light source. After a storm has passed, your electric provider quickly begins to assess the damage to the electric system. Your electric provider then begins restoring power to essential services such as hospitals, traffic signals, shelters, communication centers and law enforcement. Next, power is restored to the greatest number of customers in the least amount of time. Finally, individual services or services that need to be reconnected after repair to the customer’s damaged electrical system are restored. What If my neighbor has power but I don’t? You may be on a different power feeder line or power transformer. The transformer serving your location may be damaged. These are the last system devices to be repaired because resources are focused on restoring the greatest number of customers first. Your weather head conduit (the pipe and wire extending above your roof) is damaged or bent. If so, you must have an electrician repair it and have an inspection before power can be restored. You own your own underground service and it may damaged, which could be caused by tree roots. If so, you must have it repaired by an electrician and inspected before power can be restored. Never open an electronic appliance to dry it inside. A tube television is especially dangerous. It has components that will retain very high electric voltages for quite awhile. Unplug the appliance and let it dry thoroughly. When you notice the moisture on the outside has dried, do not assume the inside has dried. Let the item continue to dry for a few more days. Placing the equipment in the sun will help, but monitor the item closely. LCDs can be damaged by over exposure to bright sunlight. After you are certain the item is completely dry inside and out, plug it in. If it will not work right away, give it another day to dry. If the power indicator lights come on, leave the equipment on for about 10 minutes, then turn it off for about 30 minutes. Repeat the process, leaving the appliance on for an extra five minutes each try. If an appliance power indicator does not come on, and you’re sure the outlet works, unplug it and take it to a repair shop. If you see smoke or hear crackling sounds, unplug it immediately and take it to a repair shop.